People like me. You'll never see us coming. Caution! Gory content – strong stomach essential. 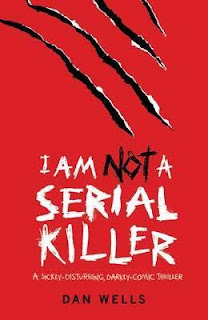 'I Am Not A Serial Killer' is a YA book about a 15 year old boy called John Wayne Cleaver – a kid that possesses a name that will put you on edge. He works in the family mortuary with his mum and aunt – his dad is absent and John….he has issues – some big ones. Not a subscription to White Dwarf, more what his therapist classes as ‘Antisocial Personality Disorder’ and a ‘monster’ that lives inside of him. He has a set of rules to keep ‘the monster’ in check in order to be a normal kid, despite his obvious defects of being a sociopath. It gets more sinister. Someone or something is stalking and killing people in John’s hometown of Clayton. On the first page someone has already had their intestines on display and the gruesome acts get progressively worse as the book progresses. As book titles go, it’s a sure fire winner. Not only does it standout as a memorable, morbid statement, the cover of ‘I Am Not A Serial Killer’ is a real eye catcher. Using black, white and lots of red, it bleeds a sinister corruption. The clawed scratch marks above the title, the spidery, angry lettering that adorns both the front and back make it a book that you will know doubt pick up and muse over if you spied it in a book shop. I quite liked the creepiness and black humour of this inner monologue answer to his mum’s innocent question of how Brooke was. Cleaver again, edges on that side of being the mysterious weirdo who one minute buys you flowers and takes you out to dinner but then starts the conversation with “so, how would you like to see my collection of shrunken heads?” There’s one superb scene where he owns one of his classroom tormentors with a creepy, Patrick Bateman-esque put down that unfortunately backfires in killing the moment with Brooke, who happens to overhear the conversation. Not wanting to give too much away, there is a specific moment in the book where a big genre shift takes place - it's not entirely unexpected, but it alters the tone of the book from a sinister mystery, to a 'hunt the demon' with the gore intensifying and Cleaver conjuring up his own theories about the killer, which are proved to be disturbingly accurate. Despite Cleaver's flawed and somewhat bizarre personality, it's difficult not to root for him - just like Bundy, he has that charm coupled with this deadpan delivery that, even if the 'monster' did break loose, you'd still cheer for him, because let's face it, the bad guys are always more fun, right?